Extensive facilities are provided at this new centre perfect for small companies, these include an in-house café, showers, parking, message services, reception, conferencing facilities and kitchen areas. All offices at this location benefit from excellent natural light, and the building is located in the Centennial Park development near to rail and underground stations, including Stanmore, which makes it a great centre for commuters. In the heart of Elstree Village this charming 19th century building provides 21st century office space with state-of-the-art communications. 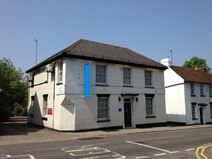 The quirky building is close to both the M1 and M25 and is just a short bus ride from train and Underground stations.